You are currently browsing the daily archive for 25/06/2010. 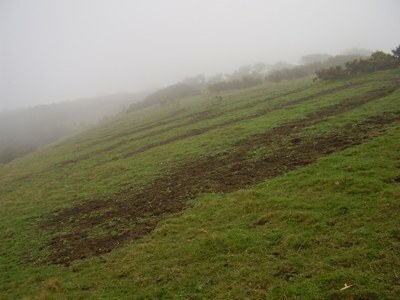 With the most recent incidents of vandalism affecting the Uffington White Horse and the Wilmington Long Man, the history of hill figures in the present century is dominated by turn overs – adoptions and adaptations by such as political groups, fundraisers, television and film stunts, advertisers, sporting patriots, and pranksters. In some cases this has been done with the consent and assistance of site guardians and heritage organisations that claim it could be achieved anyway with photography or mock-ups so they decide to control and financially benefit. In cases where it was not with the consent of such bodies, whether graffiti spraying, digging, or burning, it can have a lasting impact on the archaeology as well as the appearance. In all of these cases without exception, whether officially sanctioned or disapproved, it has lowered the public perception and esteem of hill figures as monuments. This is compounded in a number of cases by a lack of respect being promoted when the turn over is presented, both on websites and in the media, in a way that encourages interpretation of the action and outcome as harmless fun. The stance that the guardians and heritage organisations have adopted then endorses and supports this lack of respect through acceptance and approval, that in effect legitimises deployment of the actual site for purposes incongruent with long term preservation . Whilst it would be true in comparison to reflect that the actual Stonehenge has been given over to filming Dr Who, and agreed it was an opportunity to stimulate interest amongst new audiences, that site is very well protected where no hill figure is and even that hasn’t stopped vandalism of the stones. Each and every example of hill figure turn overs, whether for a worthy charity or a noble cause, makes it plain how easy hill figures are to target, makeover, gain publicity and get away with it. Time to change stance guardians and heritage organisations – let the media know you disapprove of turn overs and why. Let’s get these cheapening stunts seen for what they are by the public, and let us all afford these unique monuments the time honoured respect they deserve. Aftermath of previous stunt at The Long Man of Wilmington by supporters of the Countryside Alliance. A double whammy in which they managed to both cheapen the monument and to cause physical damage. In February of last year a Bronze Age gold lunula and two discs were stolen from a Roscommon chemists’ shop, along with the rest of the contents of a safe. 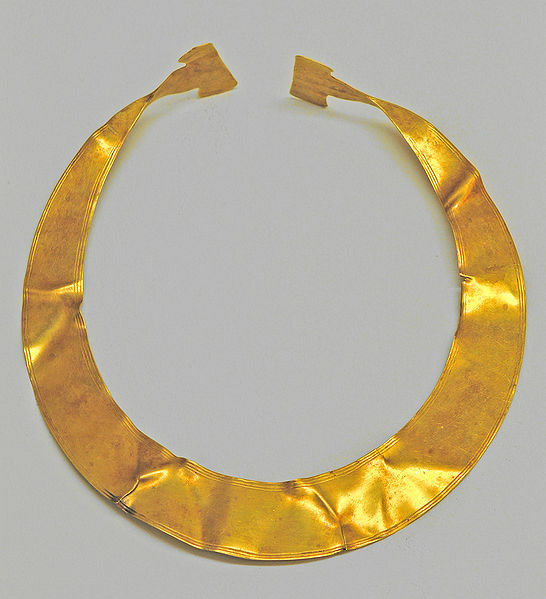 The precious objects (c.2300 – 1800 BCE) had been stored amidst sheets of paper (so the thieves didn’t even notice what they had in their possession) and Gardaí later recovered them from a skip in Dublin. Oddly, the criminals weren’t the only ones to be unaware of their significance – the lunula and discs, found in a bog back in 1945, had been in the chemists’ safe for the last 63 years.